Although details are still murky about this week’s insider attacks in Afghanistan, here’s what we do know: on Tuesday, an American major general was shot and killed by an Afghan soldier while inspecting a training facility in Kabul. A German brigadier and top Afghan commander were also injured, along with about 13 others. Later that day , an Afghan police guard opened fire on NATO troops in Paktia province before being killed in return fire. On Wednesday, an Afghan policeman shot seven of his colleagues in Tarin Kot, the capital of Uruzgan province, before fleeing with their weapons. 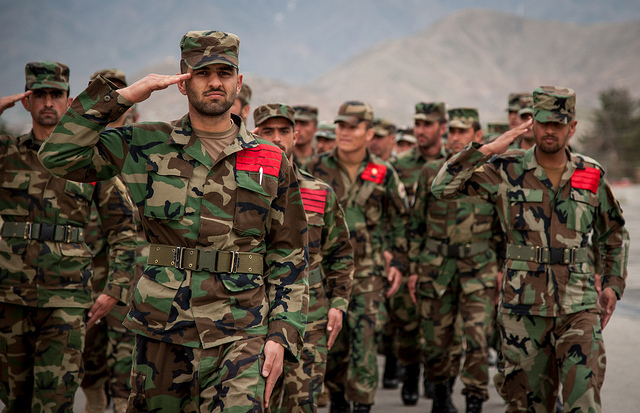 Insider attacks such as these by members of the Afghan National Security Forces carry strategic implications for the long-term mission in Afghanistan. While it’s too soon to tell how capitals committed to that mission will react, the attacks certainly won’t bolster confidence in the achievability of the task ahead. Major General Harold J. Greene is the highest-ranking American officer killed in combat since Vietnam. But while his rank and position raises the media profile of his murder, that isn’t what will scare capitals preparing for the post-2014 NATO train, advise, and assist mission. Rather, Greene embodies the intent of the post-2014 mission. He was the Deputy Commanding General of the Combined Security Transition Command—Afghanistan, which is charged with training and advising the Afghan National Security Forces. Greene wasn’t on patrol in some far-flung province or involved in active combat operations. Instead, he was an engineer and acquisitions expert helping the Afghan military improve training and logistics . While fulfilling that role, Greene was shot during a routine visit to the premier Afghan military training academy—the Marshal Fahim National Defense University. That’s a military academy the British intend to continue supporting post-2014 . Similar insider attacks are the risk countries face in supporting NATO’s post-2014 non-combat mission, even while they tell the populations that the war is coming to a close. Greene’s role and responsibilities, including visits to training centers and military academies, will be at the heart of the continuing mission. The fact that three insider attacks occurred in just two days demonstrates the limits of vetting procedures, the Guardian Angels program , and other risk-mitigation techniques. In all likelihood, Greene had more security with him at the time of the incident than the average soldier will have in the post-2014 mission. As Pentagon spokesman Rear Admiral John Kirby acknowledged , ‘Afghanistan is still a war zone. It’s impossible to completely eliminate that threat [of insider attacks], particularly in a place like Afghanistan, but we can work hard to mitigate it and minimise it and [the International Security Assistance Force] has done that.’ It’s likely Afghanistan will continue to remain a war zone, no matter what we call the post-2014 mission or how we limit its scope. Greene’s death forces nations to confront the continuing threat to their troops in the non-combat mission envisioned for post-2014. Capitals will have to judge how readily they can sell potential casualties among troops engaged on that mission to their domestic audiences. Those domestic audiences may have artificial expectations about such costs—they’re ready for the war to be over, as promised, by the end of this year. The US Army’s Chief of Staff, General Ray Odierno, has been clear that the United States remains committed to the mission in Afghanistan. Rear Admiral Kirby maintains  that the Obama administration still plans to leave a 9,800-person residual force  in Afghanistan after the NATO combat mission concludes. And ISAF Commander General Joseph Dunford has assured President Obama that he retains confidence in the Afghan military. But will other nations stand firm as they decide on their final commitments to the post-2014 mission? History suggests that’s a fair question—most attribute France’s decision to accelerate the withdrawal of French combat troops  to the January 2012 murder of five French soldiers in Kapisa Province by an Afghan solider. While a number of other countries, including Australia, have pledged to contribute to the train, advise, and assist mission, few have publicly announced numbers. Nor have troops been formally committed—not least because Afghanistan has yet to sign the Bilateral Security Agreement with the US and the NATO Status of Forces Agreement, which would allow foreign troops to remain in Afghanistan beyond this year. So we’re still in a window when it would be relatively easy for countries to scale down intended commitments in light of Tuesday’s incidents. As the international community winds down its combat footprint, a range of countries will soon confront some tough decisions. Brieana Marticorena is a visiting fellow at ASPI. Image courtesy of Flickr ISAFmedia .